Warm the heart and home of someone special this holiday season with this delightful bouquet blooming with Christmas charm. The beautiful petal-shaped vase is glazed a malachite green by the craftspeople at Haeger. 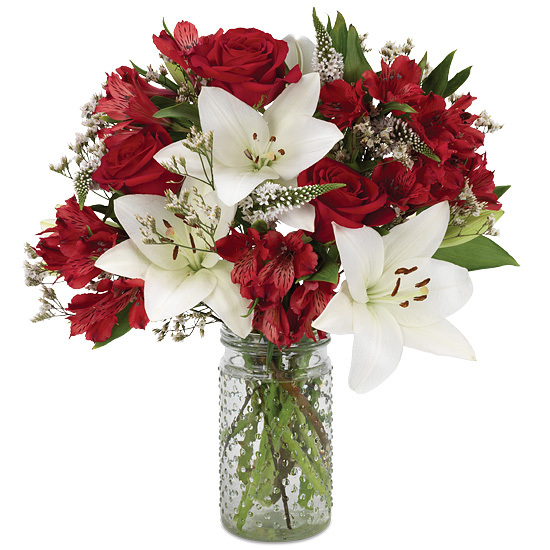 Its intriguing shape gives way to an irresistible combination of holiday-hued blooms, including velvety red Freedom roses with multi-blossomed Asiatic lilies and alstroemeria. Spirals of white veronica and sprays of mini statice add texture to the impressive display. Remove all foliage that will fall below the water line. Remove the “guard petal” on each rose – this is the outermost petal left on to protect the bud during shipment. Change water and recut stems every other day. As the lilies open, you may gently pull off the pollen anthers to avoid pollen dust. Be careful not to get lily pollen on your clothing or linens. You may wish to place a protective mat under your bouquet to prevent pollen from falling on your furniture or carpet if you do not remove the anthers.